Since we learned a month ago that the serious illness George Schmidt was suffering from would soon end his life, I've been struggling with what I would say when the end came, which it did early Monday morning. George was just shy of turning 72. As so often these days, my brain is jumbled with so much to say. I am having trouble sorting things out and I often find myself paralyzed. In George's case there is a long history. Too long to get it all down in one blog post. 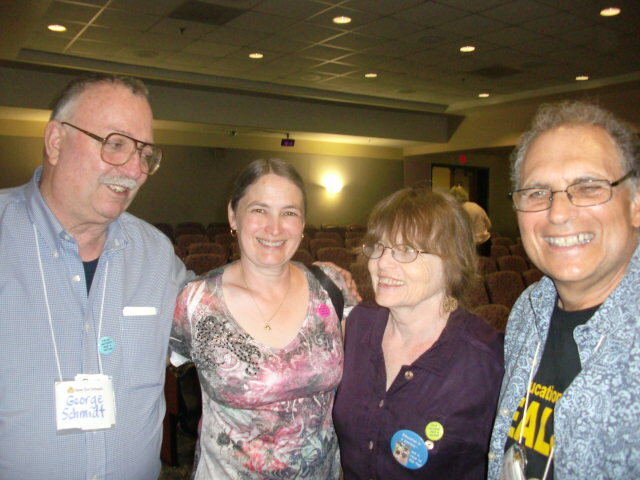 George Schmidt, Juanita Doyon, Susan Ohanian and Norm Scott at a meeting in Washington D.C. in 2010.So I will write a few things over time to fully flesh out what George has meant to the progressive teacher movement nationally and especially in Chicago. But George's influence goes way beyond teachers and education. George was one of the main initiators in the founding of CORE and used his widely read Substance (founded in 1975) as a battering ram to break down resistance to the group which was challenging a Unity-type caucus. George also used Substance in yet another victory over the old guard back in 2001 when he supported Debbie Lynch when she won the presidency. George had Substance delivered into every teacher's mailbox on three separate occasions during that campaign. I just looked back at the hard copy of Ed Notes May and June 2001 issues and I must publish them online so you will see the full nature of the Unity Caucus sellout. Susan Ohanian republished the full story of George's career-ending actions in 1999 with this article from those 5-25-01 in the Wall Street Journal. Ohanian Comment: It occurs to me that since this website was not launched until a year after George Schmidt's courageous Act of Principle, many readers of this site don't know exactly what he did. Substance cannot survive without the support of people who claim to believe in resistance. We all owe George--big time. Subscribe--and donate--now. Today. George was a life-long socialist/communist who wore those labels like a badge of honor. Yet you will never see George mentioned in the left-wing press and commentary that fawns over the social justice caucuses or the evils of high stakes testing and other aspects of ed deform. For this he suffered attacks on his integrity over the past years for daring to tell the truth. He weathered those attacks as the many people of all races whom he had worked in battling injustice came to his defense. George had as much influence on my thinking and political and educational development as anyone. At the 2016 AFT convention in Minneapolis I ran into Jackson Potter, one of the founders of CORE and at the time the head of personnel in the CTU. He invited me to join a bunch of CTU staffers and a few others to lunch. Some were curious as to who I was. I hope people will honor George with a donation to FAIR (Fairness & Accuracy in Reporting), just a fitting place. FAIR, 124 W. 30th Street, Suite 201, New York, NY 10001. Fairness & Accuracy In Reporting is the nonprofit progressive national media watch group (fair.org).